I know I so sweetly asked my husband if I could paint the cabinets, well, I am second guessing myself. My husband has almost given me the go ahead, but also so kindly reminded me that I said no big projects for this year (except tiling the backsplash and reupholstering our dining chairs). At first that didn't matter, but the more I ponder the more I realize how big of a project this really is. 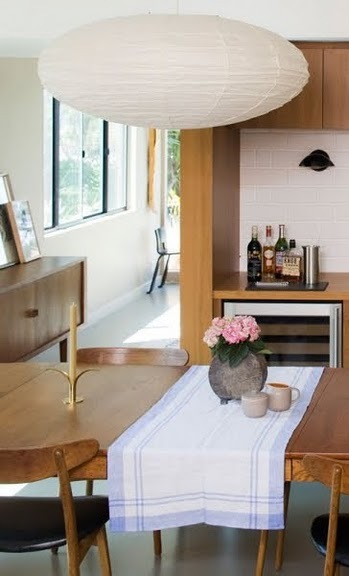 I then came across these images with cabinets the same shade as mine (although mine are not as fabulous) with the white subway tile and I love them. Maybe for the time being I should just be happy with what I got, my cabinets are only a few years old and in great condition. Oh, how my mind can change so easily. Let's just see how I feel next week.